Have you ever sat down on a Sunday night and wondered what you were going to teach the following week? (Not that any of us would ever procrastinate so long!) Planning your class at the last minute is an unnecessary stress. Here is a practical teaching calendar tool that you can use to organize your classes. It is simple, and committing to it will make your life easier. In addition to saving you time, this teaching calendar will also prevent you from reusing class ideas too frequently. It includes events, occasions, and celebrations you might want to incorporate to your classes. And it provides a loose form of periodization. Think of a spreadsheet or word processor document with multiple columns. Create your personal teaching calendar by filling in each of the columns described. There you go. It’s a very simple system but it should hold all your thoughts, notes, and music where you can find them. Of course, you can modify this sample system as you see fit so it works best for you. And think, a year from now, how nice it will be to be able to look back at exactly what you did, what you said, and what music you played on the same occasion the year prior. Then you can go into last year’s class, update your music, make any other modifications you like, and your new class is ready to go. Thanks to your own personal teaching calendar. Renee, it sounds like you really use your calendar very effectively. Thanks. I love this article and all of the comments – thank you to everyone! Thanks Mary. I appreciate you commenting. We are all busy so having some way to stay organized has got to help. Good luck with your classes! Excellent article. Given my busy professional off cycle work schedule I must confess to an occasional late night profile/music build. A tool I have found useful is Smartsheet which acts like an enhanced excel spreadsheet on steroids and easily allows embedded files plus ability to allow invite viewers and/or editors. Thanks gor sharing the good tip. I will look at it. wonderful plan Bill and thank you. I’ve followed a yearly plan as you describe for quite some time now and can’t imagine otherwise. I always make notations after each class that i can refer to the next time that profile comes up to be taught. It has totally saved me tons of time once i got the first template done. it allowed me to move rides around based on various events at the gym, to insert other new one within the focus with a lot less planning. i’m very much into the “organization” thing too and feel it allows for greater flexibility for the unexpected. For the past few years I have created a physical calendar page for each month and have filled in some of the details for my students to see. I did all the months at the outset of the year and added information until I released each month about a week early. The calendar pages were posted in several areas of the building and on the door to the indoor cycling studio. I annotated my own personal copies with playlist and other info and stored them in my logbook with contemporaneous notes that I made before and after each class. I found the graphic presentation of the material very helpful in my planning and students liked looking at the schedule in advance and planning their own weeks. Thank you. I could not agree more. I used to worry that I was repeating myself with class profile ideas. The calendar ensures that I dont. And it reminds me of class ideas I might otherwise forget. I see it just like you! Thanks. 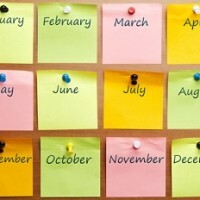 I want to add that I love the idea of posting your plan each month. I should have added that during cooldown I always summed up the next three days of classes, providing additional information and teasers. That information definitely boosted attendance at times of year when it might have slumped because people knew what they would be missing. Without my schedule/calendar/planning I could not have spoken as effectively about the next steps I would be asking them to take, or the fun we would have. Thanks very much Laura. Good question because I think the explanation got lost when I edited out a couple of paragraphs. Smart catch. All I meant was that periodization can be made as simple as using two weeks of base, two weeks of strength and two weeks of power. It is not a commonly used term and I employed it only to show how simply an instructor could use basic periodization within my calendar. Thanks for being such a good reader. Love it. Thanks for your calendars! Some instructors think that giving your class or your whole year a structure is limiting you and your creativity as an instructor. I found that it frees me. I don’t sit and try how to make each and every class completely different from the last one for no other reason than not to appear boring. I am also no longer slave to the music – as much as I love it and still teach mostly to the beat. Even if you only plan on a 6-week basis programmes where you basically progress the original ride frees up your time and helps people observe their progress. I also noticed more people coming to my power class bases on the 6-weeks schedules for another reason. In the past I had riders say: I prefer RPM class (LM) to a freestyle because I like to know what is coming. Well, with the structured programme they now do. But I as an instructor am free to decide what that programme will be rather than have to adhere to one created by the head office. Exactly, Izabela! The calendar actually helps – not hurts – my creativity in designing classes. I am kind of the organized type, to be sure. But I feel more free to innovate if I know my direction. And, yes, if you do six weeks at a time, pretty soon you will have a template for your whole year. Great thoughts. Thank you a lot.